An anniversary is a day that commemorates or celebrates a past event that occurred on the same date of the year as the initial event. 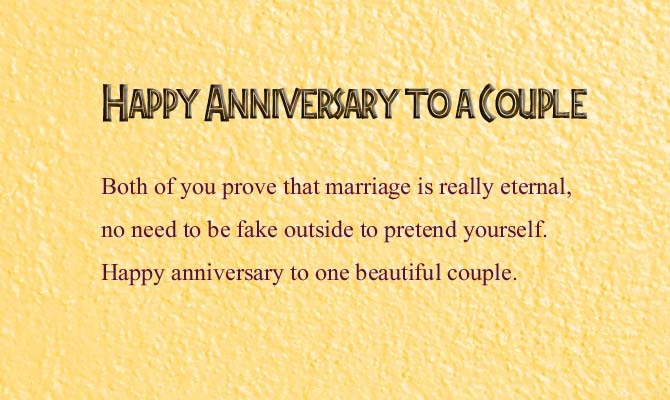 It is a date that is remembered or celebrated because a special or notable event occurred on that date and the anniversary Quotes for Couples is a great way to celebrate these remarkable and happy moments of the past. 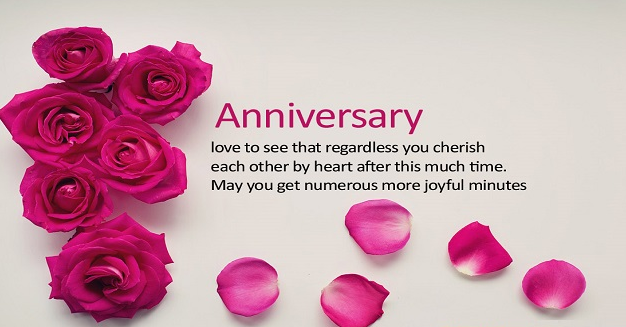 Below is an awesome list of Happy Anniversary Wishes which help you great in this regard. Your face’s wrinkles are not the indication of how much you are aged. But they show that how beautifully your relationship has survived as the time passed by. Happy Anniversary! Both of you are like soulmates for each other and together you are so strong that no one can defeat you. You both are like a perfect couple. Happy Anniversary! Your couple is so sweet and your happiness can be seen perfectly from your smiling faces. You are the happiest couple I have ever seen. I wish you a happy and loving life ahead, keep loving each other till the end of life. Happy Wedding Anniversary! Your couple has so much love that you can feel each other’s pain. I have never seen more committed couple than you. You are not only committed to each other’s soul but you both are committed to each to others dreams as well. Happy Anniversary! You look so happy on your wedding Anniversaries. This happiness is the indication of your love and how much you are enjoying your life. I wish that I also get a life like you. Happy Wedding Anniversary! People change as the time changes, but I observed that your love is still same after so many years have passed. I wish that your love remains same till eternity and pray to God that both of your remain together even after life. Happy Wedding Anniversary! Today begins the rest of your lives together. Enjoy it with love and curiosity! Happy anniversary, and may you never fight about forgetting it! Anniversaries come once a year, but create a story for a lifetime! Be happy and in love! There is no couple like you, and no greater love story than yours! Happy anniversary! Your anniversary marks the day you were finally ready for a bank credit! May it be happy! Happy anniversary! Love each other enough to go out more! I hope you celebrate this anniversary with nothing but love and hope for the future! Anniversaries are the best: you go out, drink, have your fun and still have someone to love the next day! Good news! Another year down, and you did great! Happy anniversary! Happy anniversary! I am so happy you guys don’t hate each other yet! It is said that couples in love last a lifetime! Happy anniversary! I am glad you found your soul mate in a world of single people! Happy anniversary! Another year down and the love grows stronger! Happy anniversary! I feel so lucky to have a wonderful woman – a woman that made my life complete. You are a woman that makes my day by the time I wake up till I get home from work. I love you so much dear wife. Happy anniversary. Your love is just like the love in movies, novels and dramas. In other words, it’s ideal love to every couple and happy wedding anniversary to a couple who are a treat to my eyes. Our marriage has been like good wine, it’s gotten better with age. After 50 years I’m proud to say, Happy Anniversary my dear. Fifty years you have put up with each other’s flaws and loved unconditionally. Today, repeat the promise to love each other forever. Happiest Anniversary ever dear aunty and uncle. Loved can’t be measured, it can’t be described sufficiently but if asked I would say that my life with you is the real definition of love. Happy Anniversary my love. Your common life is like the sea: sometimes it is full of troubles, and sometimes it brings you a sense of unique happiness. You haven’t got lost in a series of life events and problems, and I know that whatever happens, you will be always together. Your love story is a romance, adventure and a tale at the same time. I wish you to spend as many fantastic moments as possible together. Happy Anniversary. Do you know what the sun and your love have in common? It is always sparkling, it warms with its heat and lasts forever. Happy Anniversary. You are the closest people I’ve ever seen, you share secrets like best friends and laugh and love like soul mates. Even nature today celebrates your anniversary – the sun shines brighter and the breeze whispers: I love you. Happy Anniversary to the most loving pair! Today is a great day, the day of the birth of your love. Let every year it become stronger and shine brighter! Happy anniversary.